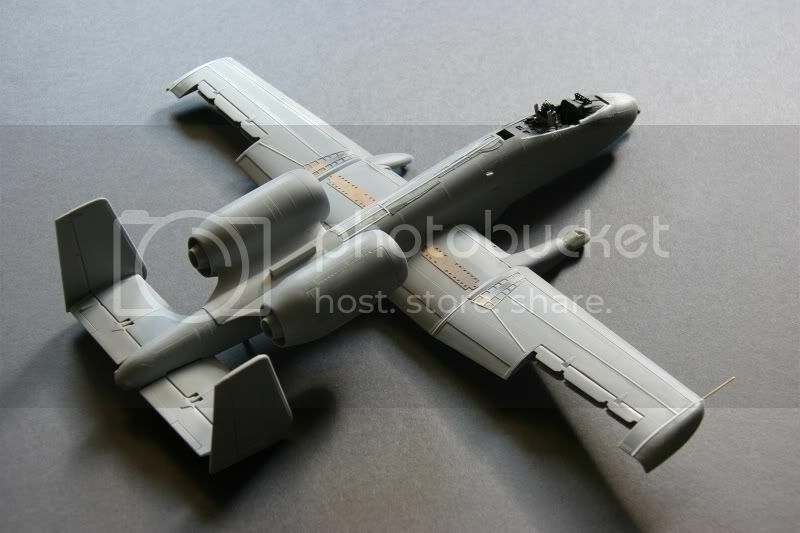 Well... after about 5 years of not building, this weekend I started something I have wanted to build for a long time, a IAF A-10. I have always loved the IAF paint scheme and always loved the A-10. 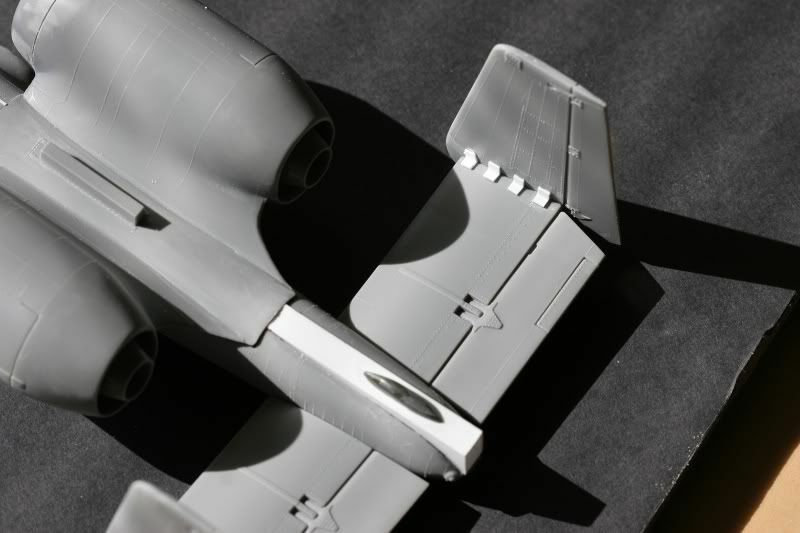 So...What would an IAF A-10 look like? Here's my Idea. 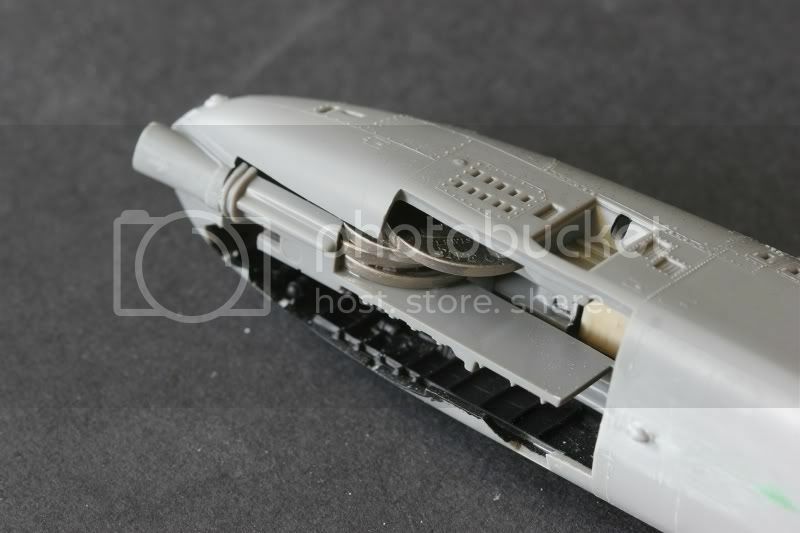 Started with the old Monogram kit with all it hundred of beautiful rivets and poor fitting engine nacelles. Started in the cockpit, was not going to spend much time here. Had an old resin seat already painted so I used it. 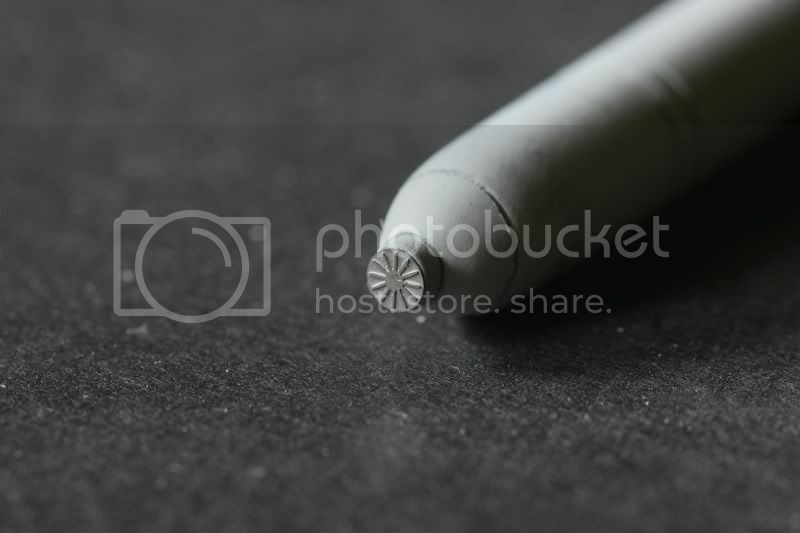 As for the tub, shot it flat black and use a silver color pencil to punch out the detail. Putting the fuselage halves together, all of those f#&$ing rivets come into play. Sand off and add new detail OR try and save them? (Thatâ€™s funny) I sanded them off and added new detail. 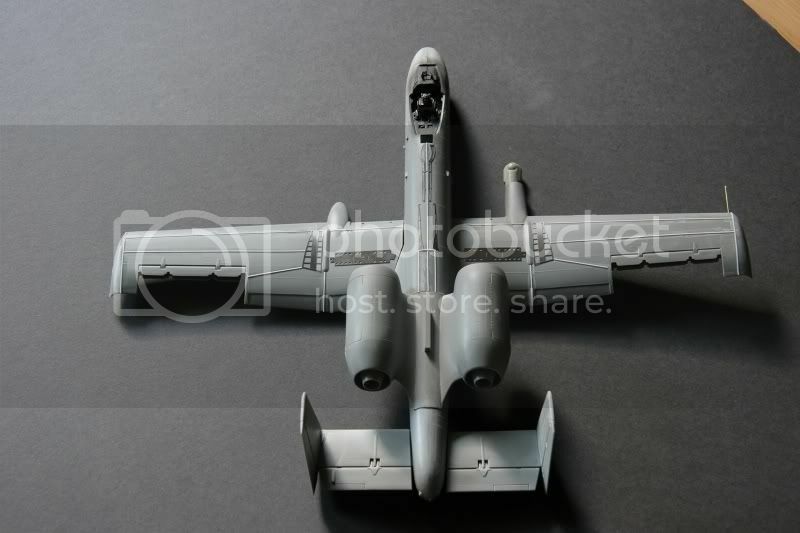 I figure if the IAF ever got any A-10s they would be at or near their service lifes. 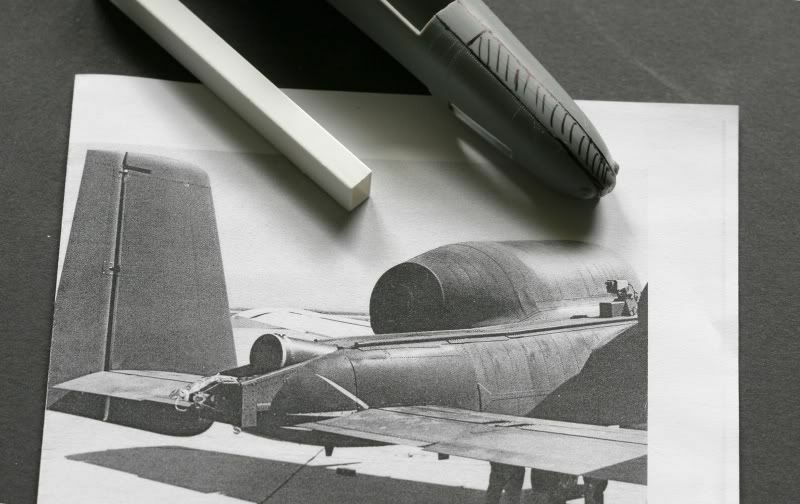 So the IAF would need to reinforce the fuselage as well as the wings. 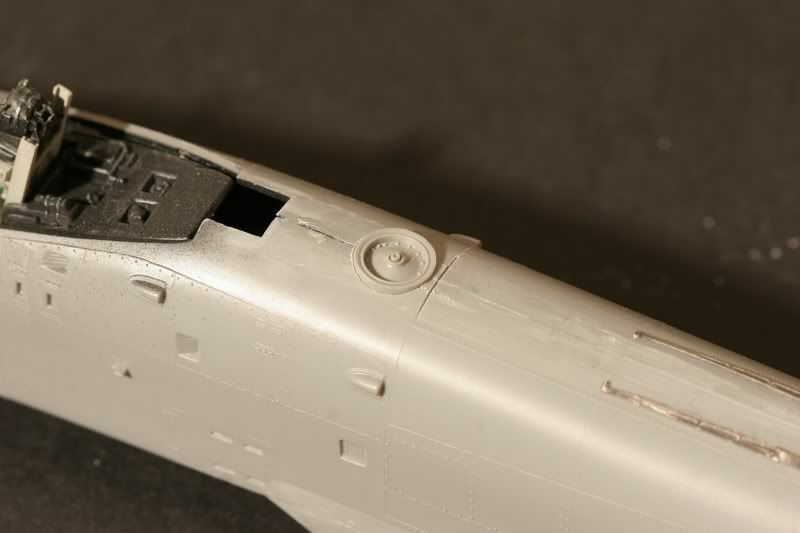 For the reinforcement strips, I used strip styrene and Eduard PE sets (EF-2000, Tornado F3, F-15E and 1/32 F-14) Also replaced the pitot tube with a brass rod. I known the engine nacelles would needed some loving. 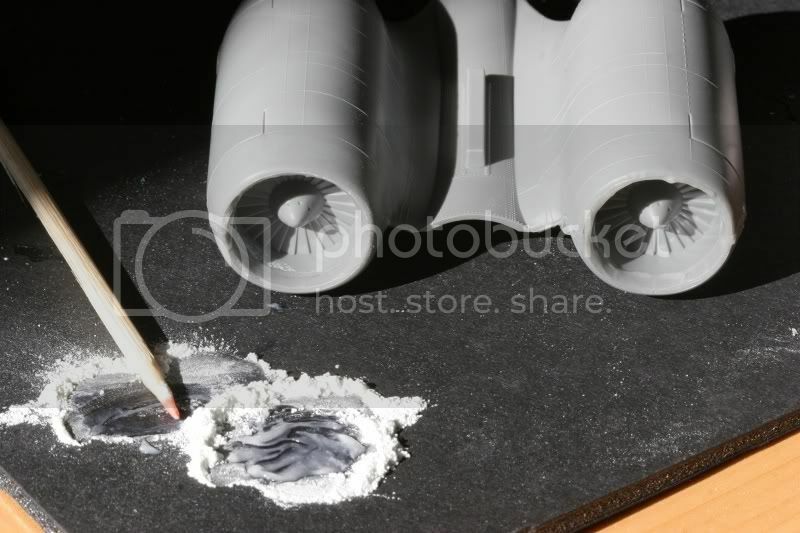 Once together, I used my favorite putty, super glue and baby powder. Try it! (Gel works better) It sets up fast and its hard as monograms plastic. After about hour and half of sanding, shot some color in them for a look see. Not bad, not finished but close. The IAF always modifies their aircraft to suit their needs. This is the fun part. 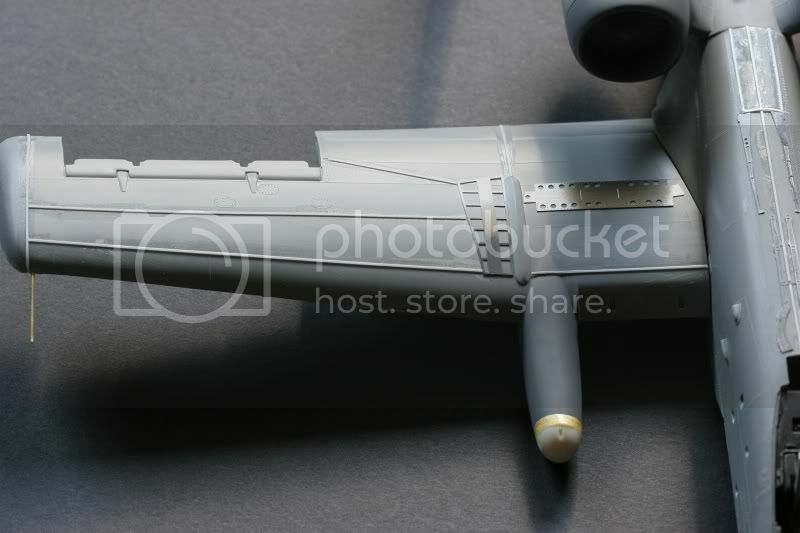 I wanted to add a targeting pod or a radome kind of like the radome on the F4U Corsair back in Korean. And did not want to use a weapon station for a pod. 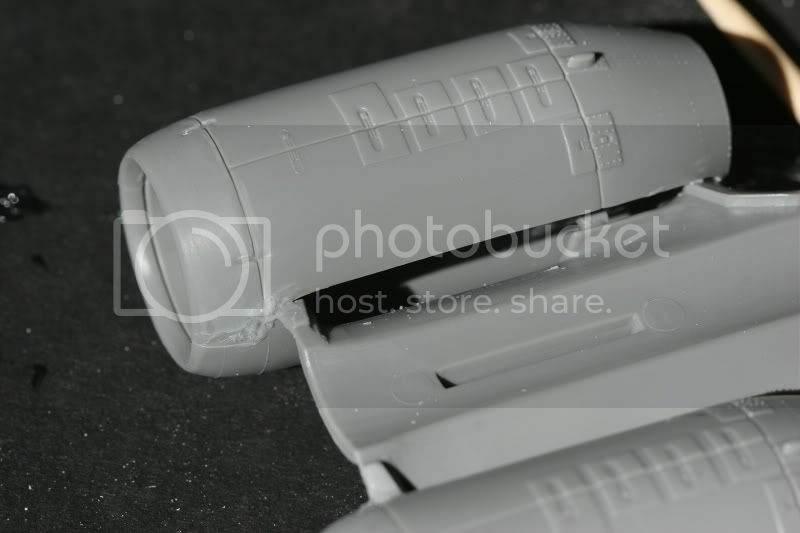 So I figure the main gear fairing would make a great place for a targeting pod or radome. Got an old F-4 fuel tank and my trusty razor saw. Super glued the new pod assembly in place and back fill the gear fairing with my favorite putty. Filed, sanded into shape. The radome is resin. 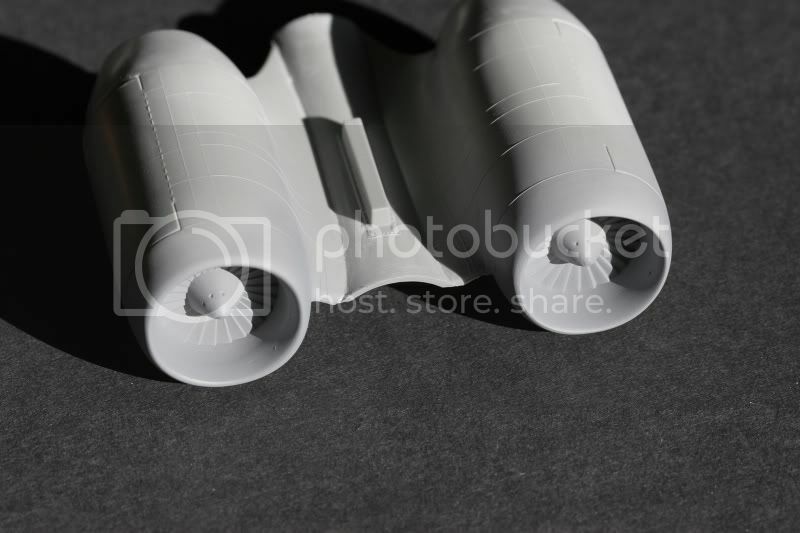 But looked in my part stash and found a targeting pod. Saw off the head of it. 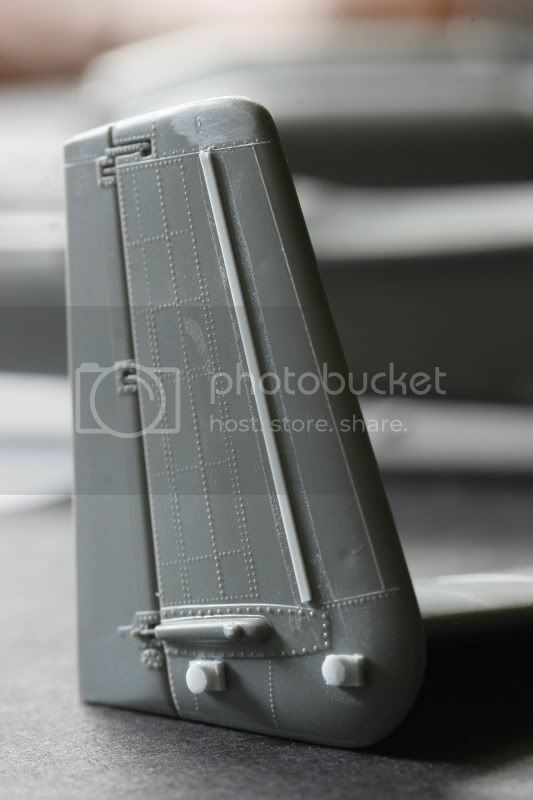 Unsure about radome or targeting head? Here she is dry fitted. Not bad for two days work! Lookin' cool. Keep up the good work and more pictures please! Thats pretty cool. Defenitly an original concept with the extra bracing, I'm looking forward to more WIP pictures. I would hate to think of what the parasitic drag would be if it were real, especially with the wing bracing, but this is definitely ambitious for a what-if. Nice job. Lookin' good! The idea of the reinforcement plates is really cool! 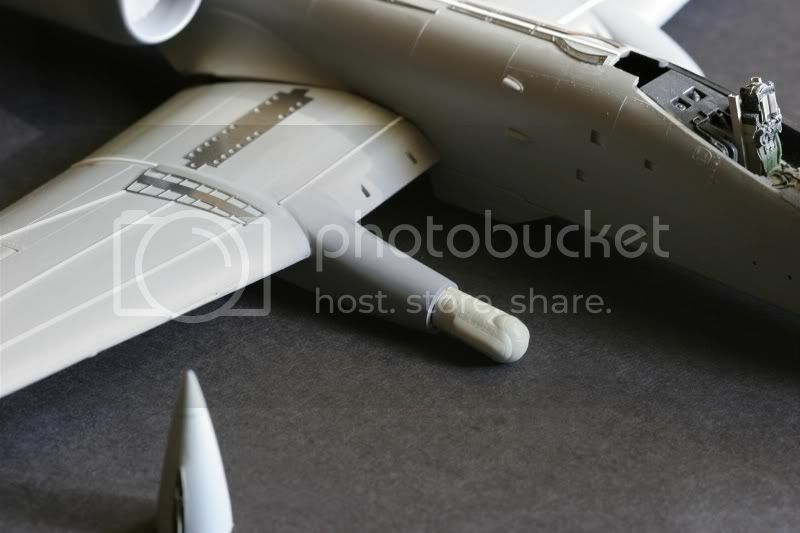 Have you thought about the paint scheme yet, gonna go with the typical IAF style ? Yeah, typical IAF style.Tan, Middlestone, Light Grey Green with Light Compass Ghost Grey underside. Should look cool. 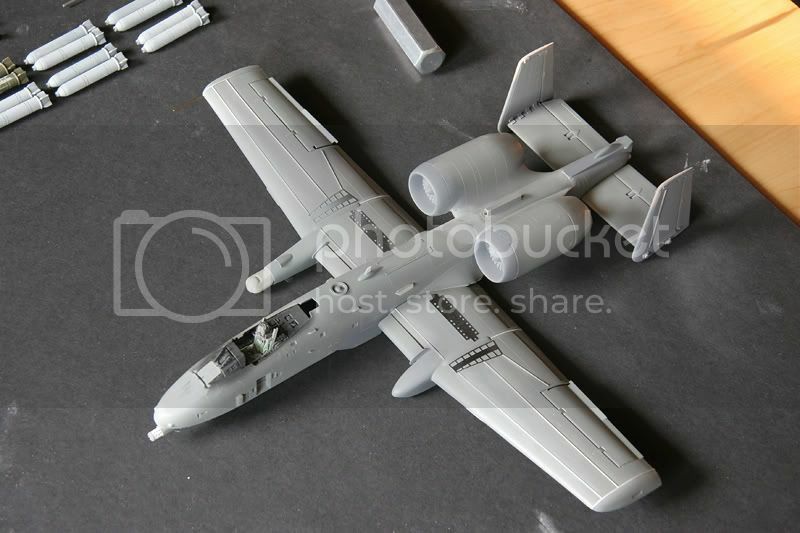 This past week I made a little more progress on my IAF A-10I. 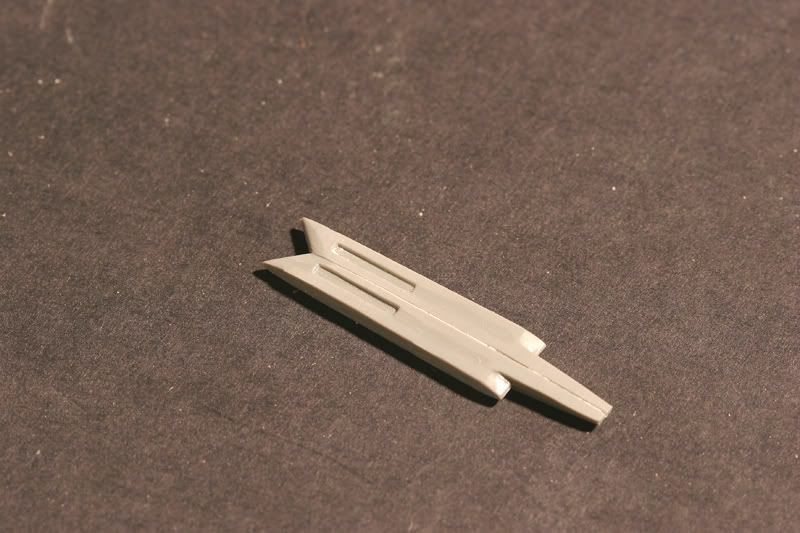 As we all know the Monogram kit come with the decelerons in the open position. 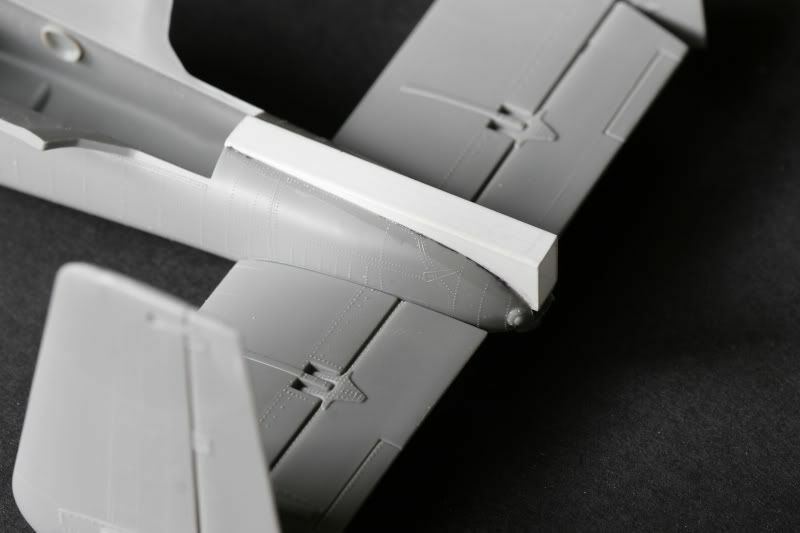 Well the IAF decided to remove and replace them with a traditional aileron. :) A drag parachute was added to the tail to slow the "Sand Hog" down during landing. I found an old photo of an A-10 during spin testing with drag chute housing. Mine will not be a copy of this housing but will be use for reference material. I used a piece of rectangular tubing for my housing. On to the tails. 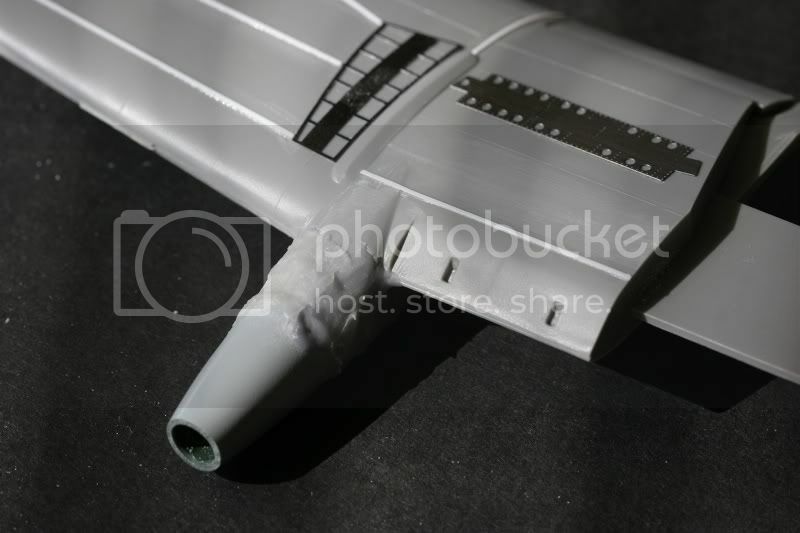 Like the fuselage, the tails need to be reinforced. Using some L-channel and cut some braces like on the F/A-18 Hornet. 4 per tail super glued in place. 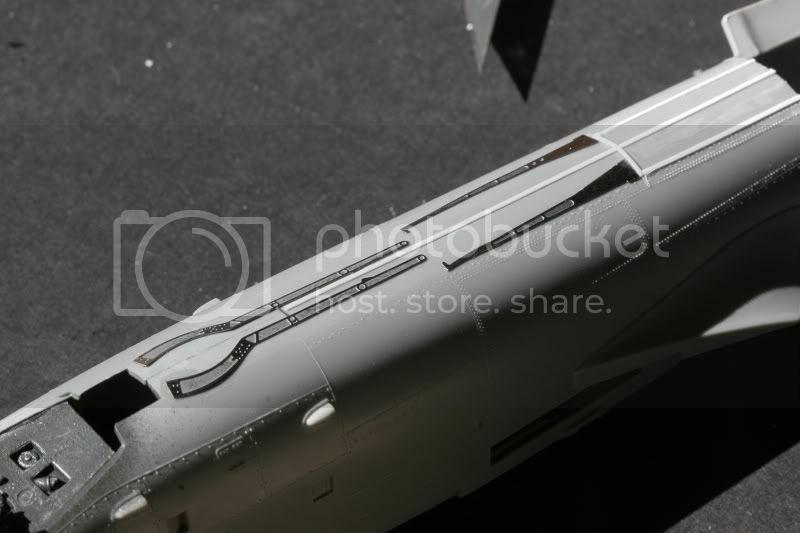 Not going to add the formation light strips, the IAF just paints over them anyway (F-15I). Going to add the Embedded GPS dome. Searched my parts stash for something that look similar, found a nose wheel from.... Don't know what? But cut off most of the tire and sand it round. Cut a hole roughly where I wanted it and glued it into place. Outstanding work. Got to love what if Hogs! Made alittle progress this week. 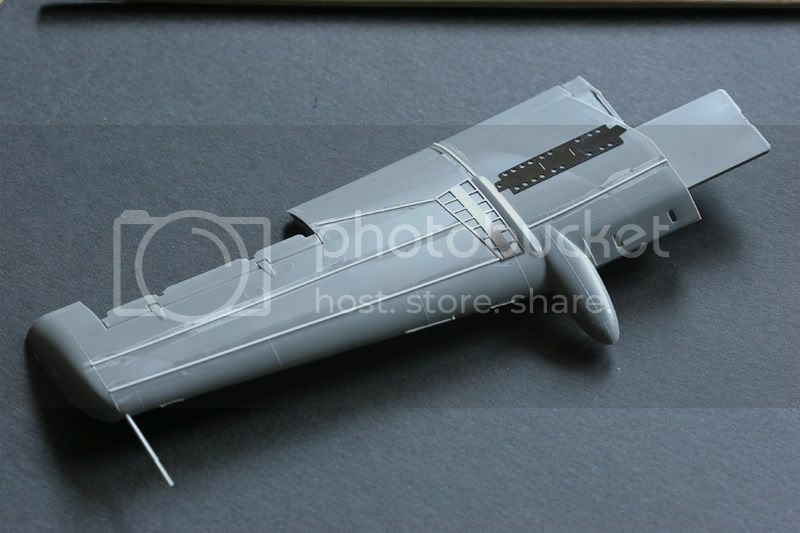 This time some airframe work as well as some weapon details. Knowing the "Sandhog" is going to be tail heavy, I added 20 cent of nickels for nose weight. Hope that will be enough. B) Little more detail on the tails, added two new bumps to each tail(scratchbuilted) and a a strip of styene as a reinforcement strips . The air intake located atop the fuselage between the engine nacelles was filed open.I also added a new bump with a blade antenna just behind the GPS dome. The gun barrel cover looked like crap. So I cut it off and replaced it with a piece of styrene tube. 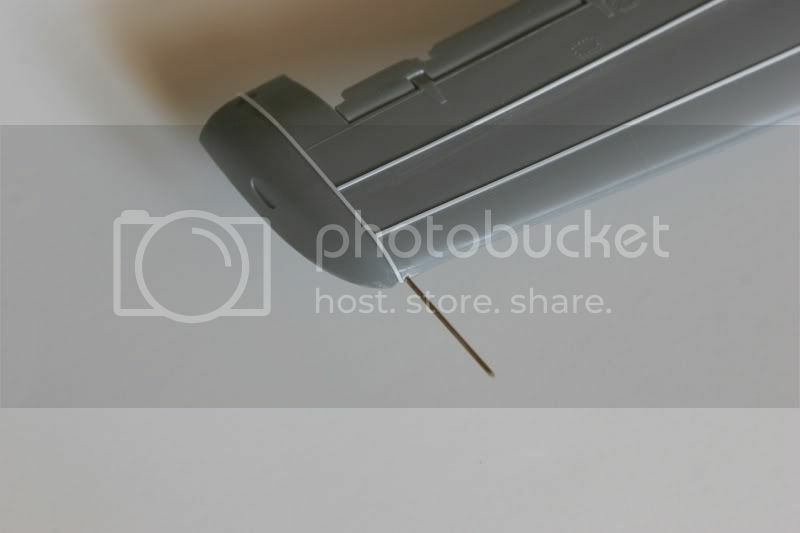 With a no# 61 twist drill and lots of patience, I drilled the hole in the gun barrel cover. Than glued the kitâ€™s gun cover plate to it. 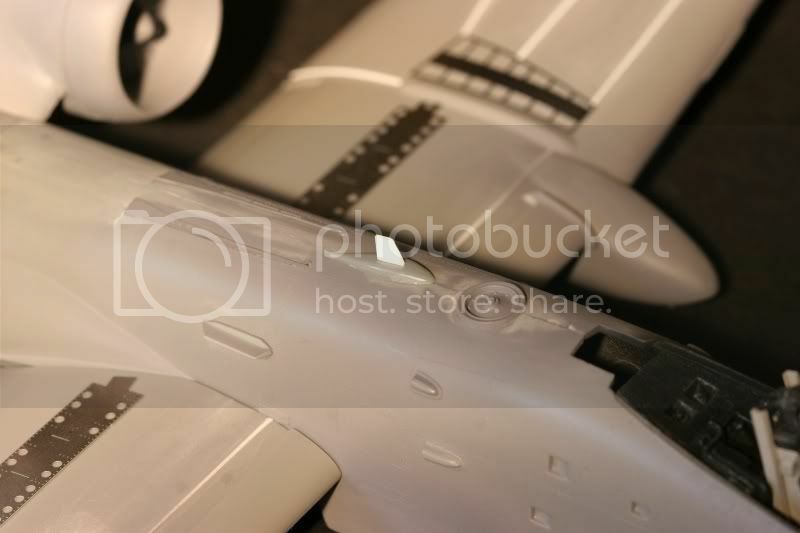 As for underwing stores, will have cluster bombs, 500lbs GP bombs, few Mavericks and an ECM pod. Still looking for some scale drawings of some Python 4s. 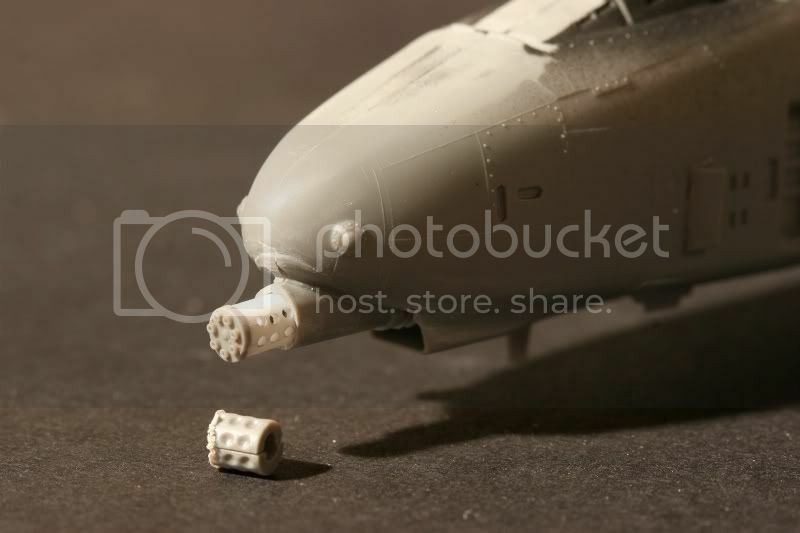 The Cluster bombs and 500lbs GP bombs are from the Academys F-15E kit. I rescribed the panel lines with my razor saw using tape as my guide. I wrapped the tape around the bomb a few time so it would proud of the surface. Now riding the edge of the tape, a few pass around each side of the tape, nice straight lines. 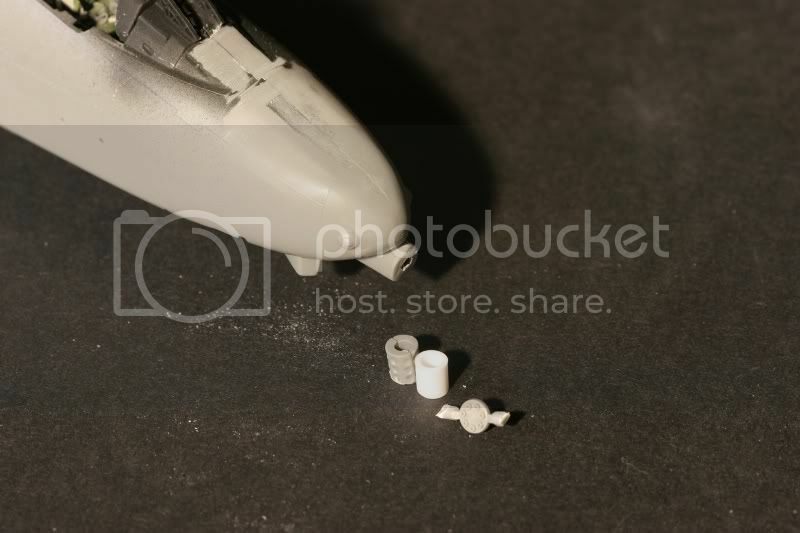 Added Eduard PE fuzes to the nose of each bomb using white glue. Since the IAF don't not play fair, I'm going to added some "Daisy cutter" fuses to my 500 pounders. Using one of Monograms bomb as a guide. 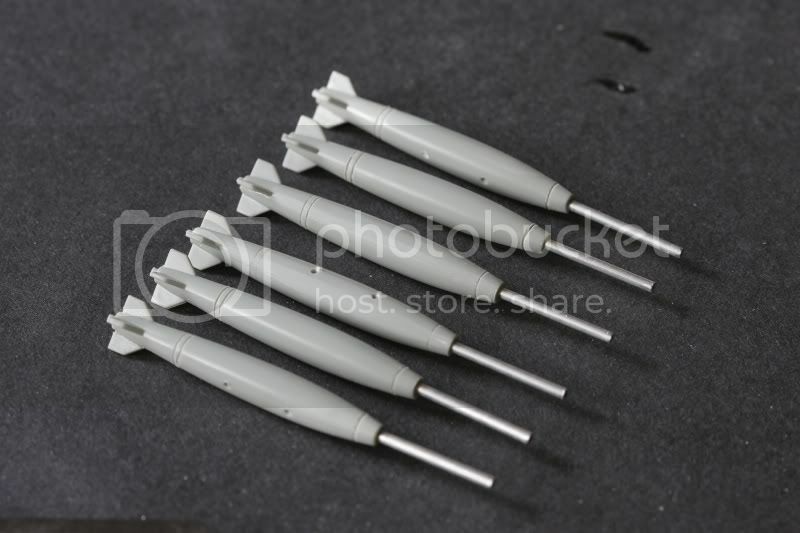 I cut off the kits fuse and drill a 1/16 hole in the head of each bomb. 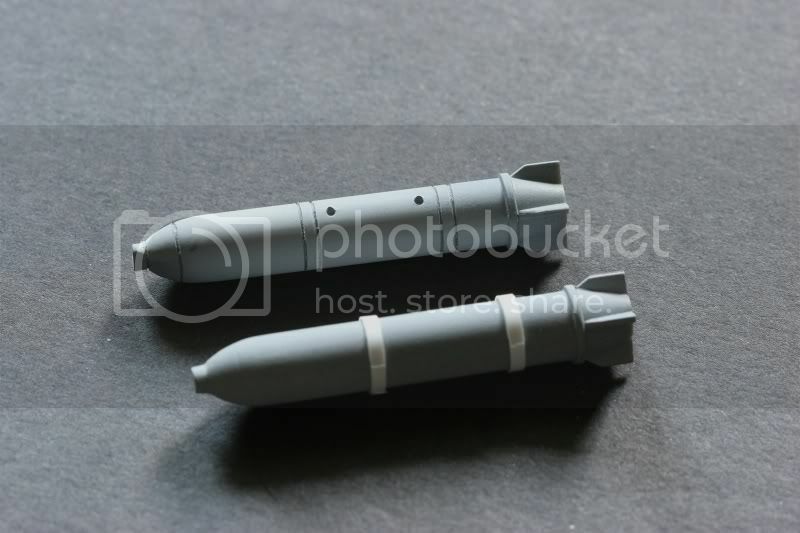 Use 1/16 aluminum rod for the fuze extender, I measured and cut a fuze extender for each of the bombs and super glued each in place. I also rescribed the panel lines with my razor saw. 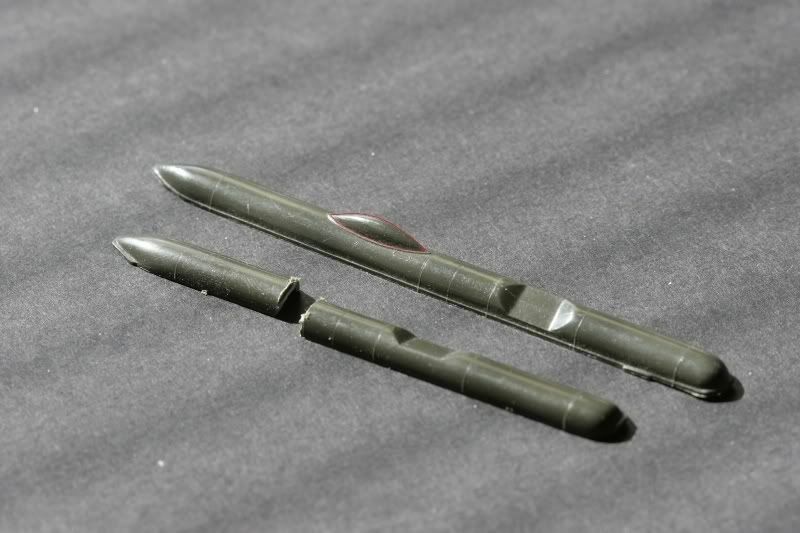 Will add a Eduard PE fuze tips to each after painting and weathering. Excellent work Steven, your Sand Hog is going to be fantastic ! Looking good! I can't wait. Excellent work ! I really enjoyed reading and watching your progress on this one. I especially like the idea of adding to the wheel wells....great idea ! This week made some more progress, still playing with weapons. Once I glued together, sanded and primed my ECM pod, I notice the bands on the lower body were gone. Wanted to replace them but did not know what to use. Did not have any strip styrene that thin and was not going to go out to buy some. (Why spend money? when you can make it or use something else). I do have some 1/16 vinyl pinstripe tape in my tape stash. 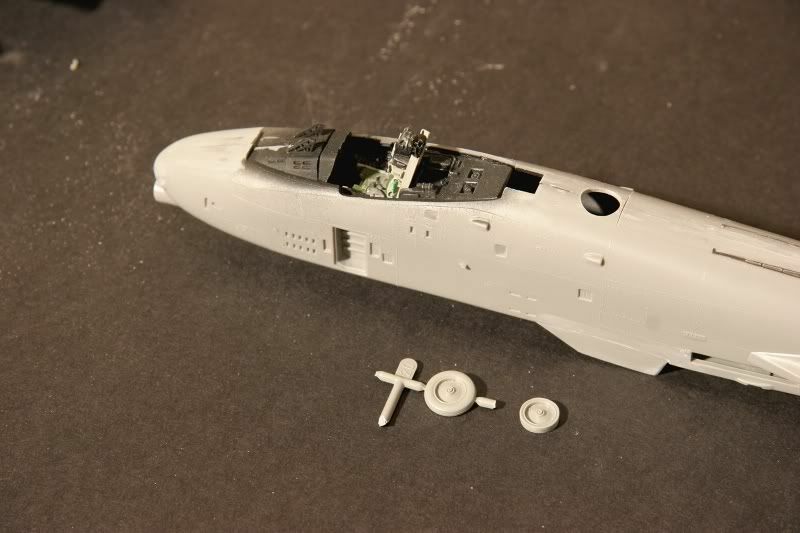 But first had to sand through to primer to get back to bear plastic. Some 600 grit and 5 minutes, good to go. I rolled off about 6 in piece and place each band leave a bite of excess. And with a new no# 11 blade, trimmed each band to length. Then I hit each band with Pro weld. 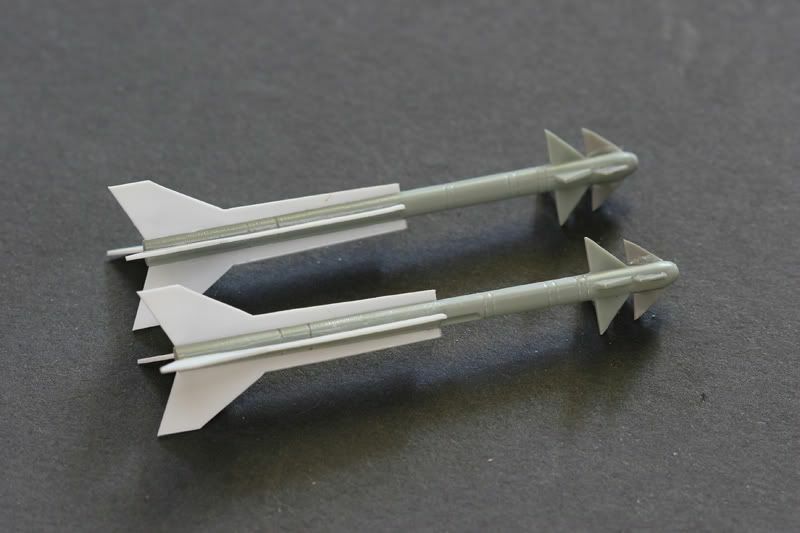 As we all know the IAF plays dirty, especially when it comes to air-to-air missiles. Wanted to put some Python 4's on my Hog. 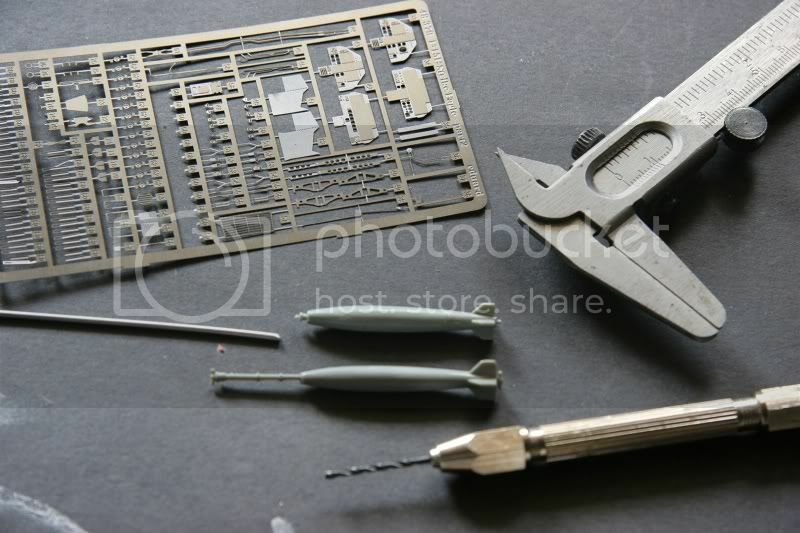 Was not going to buy some aftermarket ones, just going to make some myself. From researching, I found the Pythons have a larger diameter body then the Sidewinder. 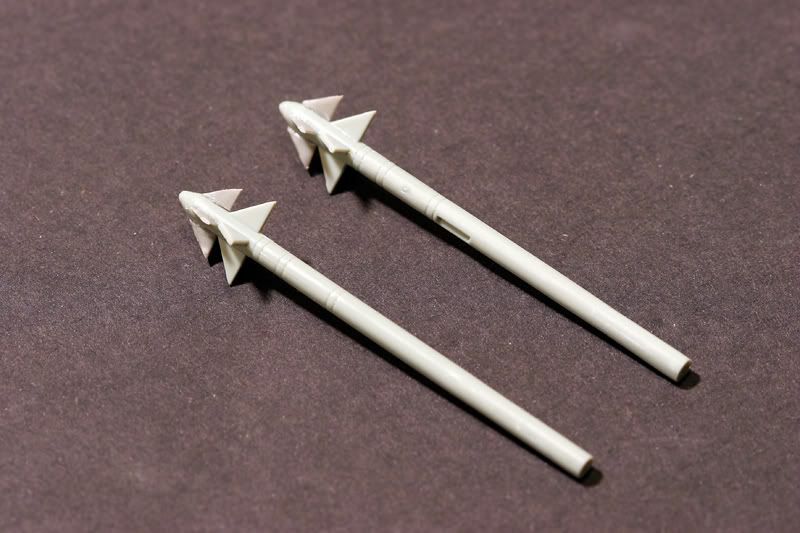 Was going to start with some 2.5mm styrene rod but after looking in my missile stash, going to start with some Academy sidewinders from their General Dynamics F-16A/C kit(kit no# 1688) The reason why is they are by far some of the worst 1/48 scale AIM-9s around mainly because the bodies are too fat. I cut off the rear fins and sand the canards to it new shape. The head of the Python 4 has two set of canards, the first set are a little smaller than the second set. Now needed some smaller canards. 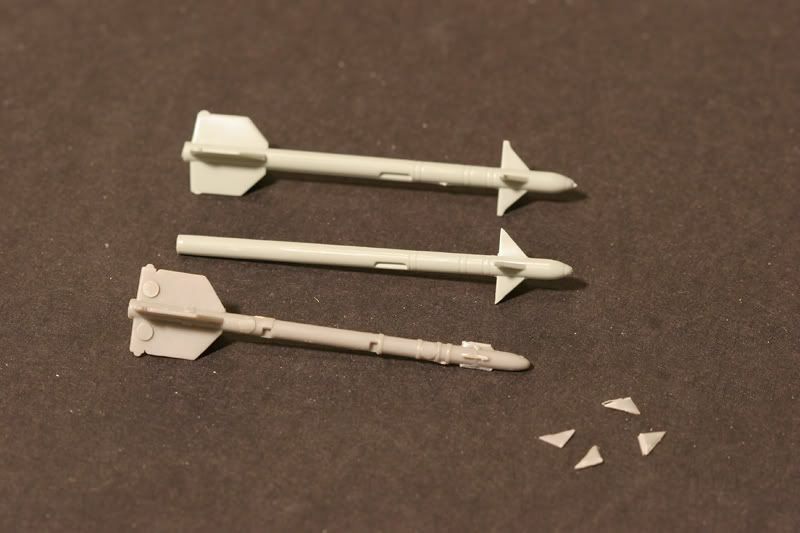 Back in the missile stash, found two Monogram AIM-9s and cut off the canards short of the control rod. 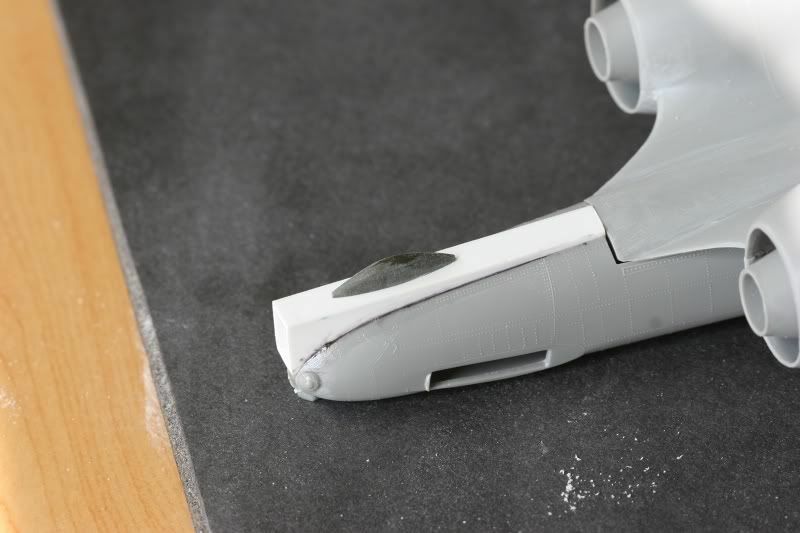 With some tweezers, I super glued each canard in place. Now on to the rear fins. After searching my missile stash again and finding nothing that even came close to the Pythons rear fin. Now what? Well... I could just make them from some sheet styrene. 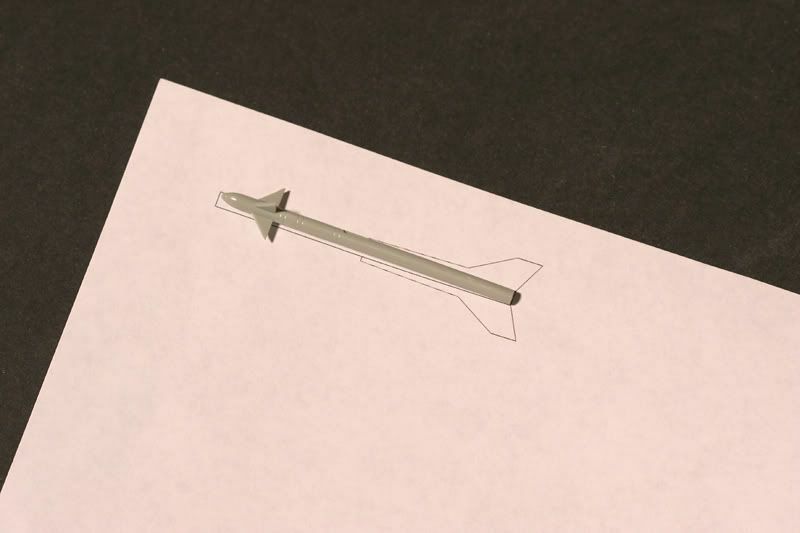 My biggest fear was how to cut out all 8 fins (for two missiles) perfectly. Had to think about that one for a while and than it hit me! You can draw it in Photoshop! After measuring my "want-to-be" Python bodies, I drew it up in Photoshop. After a bit of drawing/printing/redrawing/printing, I finally got the shape close enough and one that I was happy with it. 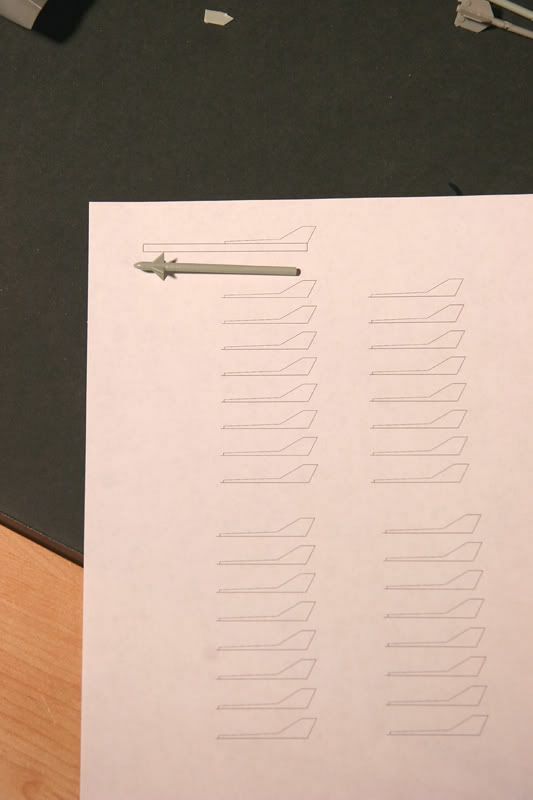 I than copied and pasted enough fins for four missiles (did not know how many times I was going to f*&k it up) File/save as/print. 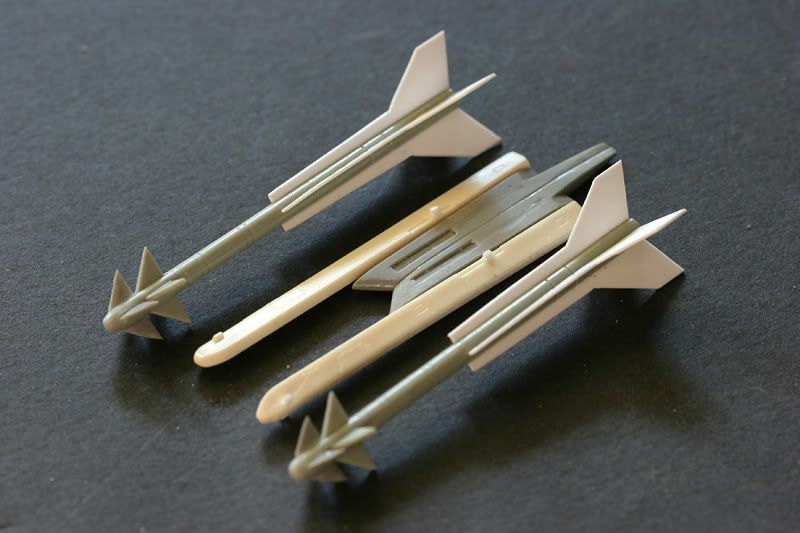 I them Super 77 it to a piece of .015 sheet styrene. Was a new no#11 blade and a good clean scale or straight edge, cut out each fin. Once I had 8 good fins I than glued each fin to the body use Pro weld. Still got to add the Roll control vanes aft of the two sets of canards. 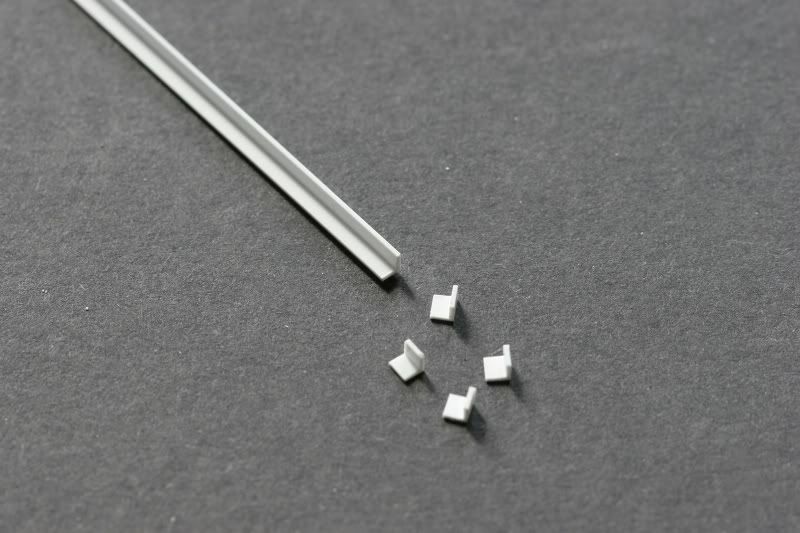 Will use some .015 X 1mm strip styrene. 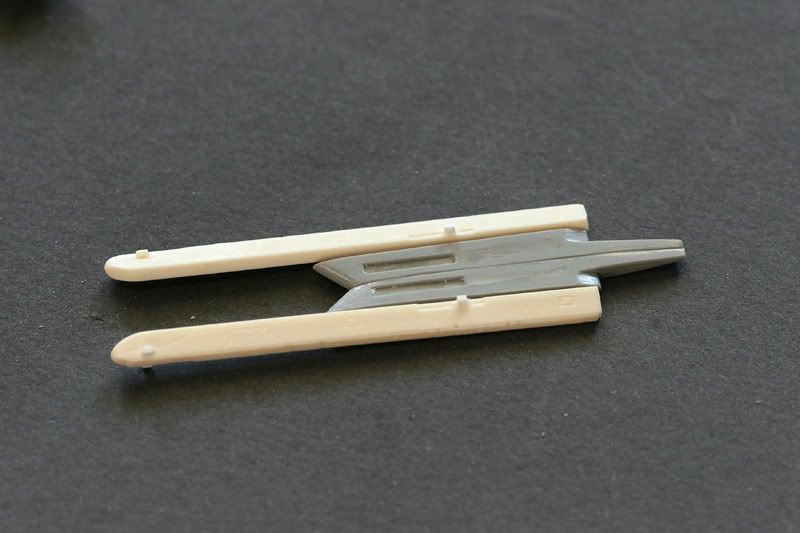 If you want a copy of the Python 4 rear fins, you can get it here >>PYTHON 4 REAR FINS<< Print full size for 1/48 scale. Now that I got two Python 4s, need a hard point to put them on. 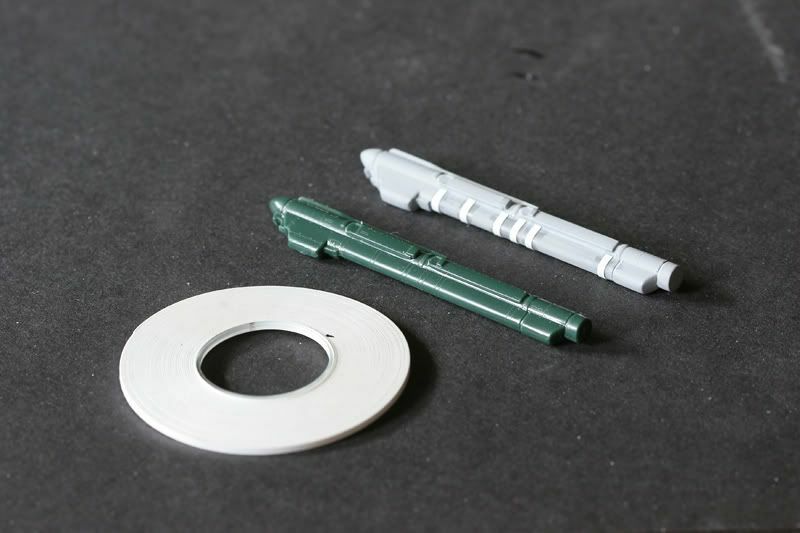 Found two hardpoints from Monogram old Iron Curtain MiG-29 kit. With my razor saw, I shorten both of them and super glued them together. 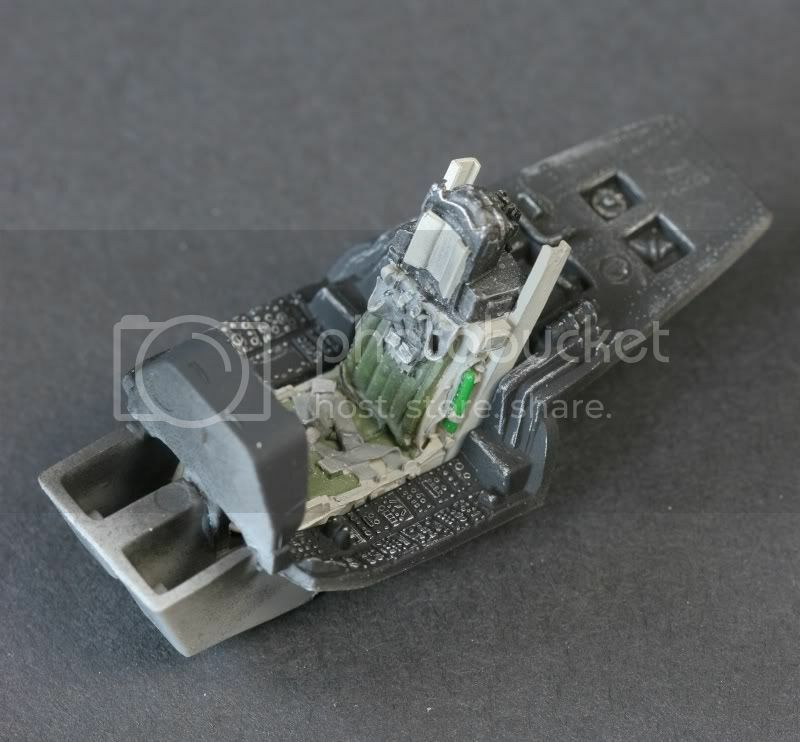 Some time ago I case and poured some LAU-129 launcher, going to add them to my new dual missile rail adapter. Python 4s on the A-10?! Oh, that is so wicked! Love it.